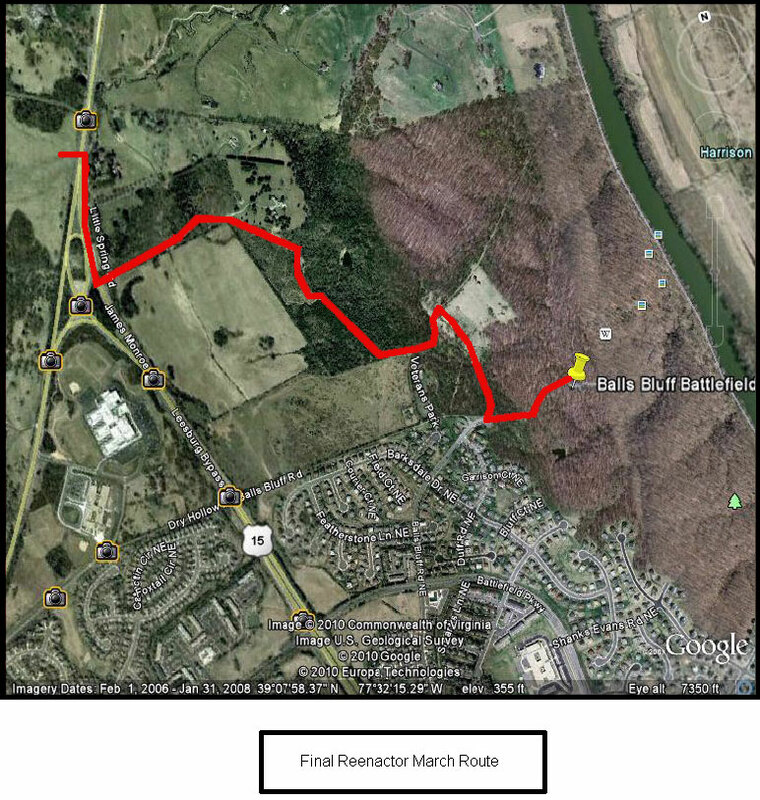 Nearly 1,000 Civil War re-enactors and some 2,000 spectators converged on the Ball's Bluff battlefield near Leesburg Saturday to stage the largest ever re-enactment of the 1861 engagement. Warned to put their ear-plugs in and turn their hearing aids off, the crowd was treated to a thundering hour-long program that began with a skirmish between Confederate and Union units in the woods and ended with a surge of southern re-enforcements capturing many of the northern soldiers and driving the rest into the Potomac River. 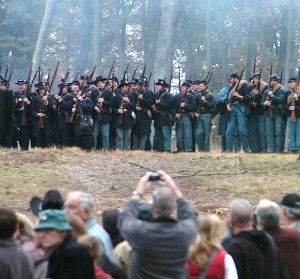 The spectator area at times was surrounded by the sounds a gunfire as units advanced, retreated and flanked their foes. The frequent booms of Union howitzers, whose construction was commissioned to help mark the 150th anniversary of the battle, could be heard well beyond the confines of the regional park. Activities continued Sunday at Morven Park, where visitors toured encampments from 9-10:30 a.m. and viewed a re-enactment of the Battle of Dranesville at 11 a.m. At 12:30 p.m. a wreath-laying ceremony was held at the Baker Monument at Ball's Bluff Regional Park. Text is slightly edited by CWL. 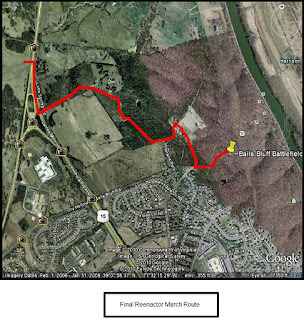 CWL sent these remarks to the cwdg.yahoogroups.org on the Monday after the Ball's Bluff commemoration reenactment on October 21, 22, 23. 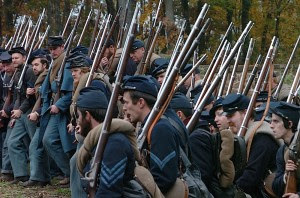 As an infantry re-enactor who has been on campaign since 1993, me and my pards would list the 2011 Ball’s Bluff as among the best in in our experience. 3. size of reenactment group, not to large not to small [with the exception of the Rebels, whose enlistments fell noticeably short] 4. And of course, great weather. As we were leaving the question arose, when are we coming back? Is there an interest by the organizers that having Civil War re-enactors do a NPS style living history on the Ball’s Bluff location annually? Slight disappointments: A. Friday’s fire wood supply contained a lot of dead wood that wouldn’t make heat; B. and in the ‘it never gets done’ educating the re-enactors on the battle that is being commemorated. Many re-enactors come on the field knowing lots about Gettysburg but not much about Ball’s Bluff and other smaller engagements. A one sheet, both sides with maps handout would go far with re-enactors and, come to think about it, spectators too. I am one of those re-enactors that walk up to spectators and start conversations and it would be nice to have a common piece of information about the battle to talk about with spectators. 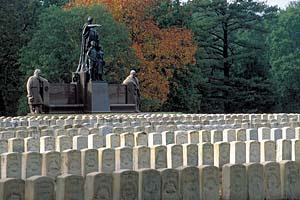 Army Museum's Morbid Oddities Resettled In Maryland, Associated Press, October 17, 2011. 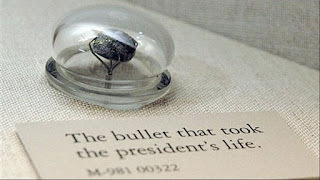 The bullet that killed Abraham Lincoln is mounted under glass, like a diamond in a snow globe, in its new home at the National Museum of Health and Medicine. The lead ball and several skull fragments from the 16th president are in a tall, antique case overlooking a Civil War exhibit in a museum gallery in Silver Spring, just off the Capital Beltway. The military museum, known for its collection of morbid oddities, moved in September from the former Walter Reed Army Medical Center in Washington. At Walter Reed, visitors had to pass through a security gate and find the museum on the campus, where parking could be a problem. The new building stands outside the gates of Fort Detrick's Forest Glen Annex. Visitors can just drive up, walk in and come face-to-face with a perpetually grinning skeleton directing them to an exhibit on the human body. There, one can see a hairball from the stomach of a 12-year-old girl and the amputated leg of a man with elephantiasis — a disease that causes limbs to become bloated. The leg floats upright in a glass jar like an enormous, pickled sausage. The museum's collection of 25 million objects includes plenty to inspire fascination or disgust — or both. But it's also a treasure trove for researchers like Candice Millard, author of the new book "Destiny of the Republic," about the assassination of President James Garfield. She wrote in her acknowledgements that she held in her gloved hands at the museum the section of Garfield's spine pierced by a .44-caliber bullet from Charles Guiteau's gun. Guiteau's brain and partial skeleton are also in the museum's collection. Deputy Director Tim Clarke Jr. said the museum will close in January and reopen by May 21 with its largest-ever display of objects to mark its 150th anniversary. The scope of the exhibits is still being decided, he said. "We are sure, though, that we are programming and planning an exhibit that will astound our visitors," Clarke said. The $12 million relocation established a permanent home for an institution that has had 10 addresses since 1862. That's when Surgeon General William Hammond directed medical officers in the field to collect "specimens of morbid anatomy" for study at the newly founded museum along with projectiles and foreign bodies. A photograph nearly covering one wall of the museum's new Civil War exhibit shows amputated legs stacked like firewood. The exhibit also includes the shattered bones of U.S. Army Maj. Gen. Daniel Sickles' lower right leg, mounted for display beside a 12-pound cannonball like the one that hit him during the 1863 Battle of Gettysburg. Most of the museum's objects, including 2,000 microscopes and hundreds of thousands of human brain specimens, are in an off-site warehouse. They will be moved by next spring to a renovated warehouse across the street from the new museum. Clarke said the requirement to safely pack, move and unpack each artifact will enable the museum to get a better handle on the number of artifacts in any given collection and the grand scope of the entire collection. One thing the museum won't do is destructive testing of artifacts. That's what the Grand Army of the Republic Museum and Library in Philadelphia learned when it explored the possibility in 2009 of comparing DNA from a Lincoln bloodstain in its own collection to the Lincoln anatomical specimens at the National Museum of Health and Medicine. Eric J. Schmincke, president of the Philadelphia museum, said he appreciates the desire to keep an artifact intact. "You don't want to take any chances like that," he said. "It's because you want them to see what you have. It's history." By awarding the 2011 Coffman Prize , The Society of Military Historians has recognized The Seasoned Soldier: Coping with the Environment in Civil War Virginia. 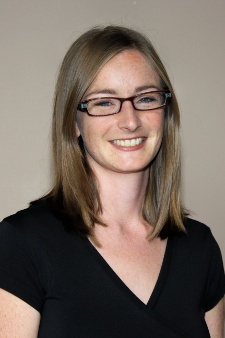 Kathryn S. Meier. The Seasoned Soldier: Coping with the Environment in Civil War Virginia by drawing on a wide array of official and personal accounts examines the ways in which Union and Confederate soldiers understood and practiced self-care during the Peninsular and Shenandoah campaigns of 1862. Notwithstanding seminal efforts by the U.S. Sanitary Commission to improve soldiers’ living conditions, military medicine on both sides remained rudimentary and principally concerned with rooting out malingerers. Consequently, principal responsibility for maintaining physical and mental health—as well as combat effectiveness—devolved to the soldiers themselves. Over time, they acquired the skills required to look after their bodies and stave off melancholy, rendering themselves “seasoned soldiers.” Their respective armies depended on such men, even if they did not always understand or approve of their methods. What officers interpreted as desertion or straggling, the men often considered essential sojourns—necessary to mend bodies, augment diets, or restore nerves. Innovatively combining military, medical, and environmental history, A Seasoned Soldier sheds new light on two of the most storied campaigns of the Civil War and points the way for future scholarship in the field. 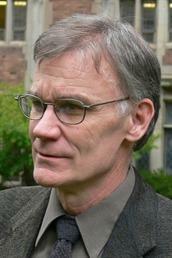 A Note From Dr. Meier to CWL: The manuscript is under review at UNC Press. I have my fingers crossed that if the process goes well it will be out in about a year. Until then a dissertation version of the manuscript can be read online via Alderman Library at University of Virginia, under the title “'No Place for the Sick': Nature’s War on Civil War Soldier Health in 1862 Virginia" or an article summarizing the argument appeared in the June 2011 issue of The Journal of the Civil War Era under the title “‘This is No Place for the Sick’: Nature’s War on Civil War Soldier Mental and Physical Health in the 1862 Peninsula and Shenandoah Valley Campaigns." Faces of the Civil War: Mary Chesnut's Photographs Back In Family Hands, Robert Behre, Post Courier, October 10, 2011. Mary Chesnut, wife of U.S. Sen. James Chesnut Jr. of South Carolina on the eve of the Civil War — a man who played a pivotal role in the war's first shot at Fort Sumter and later served as an aide to Confederate President Jefferson Davis, wrote an extensive diary widely praised as one of that era's greatest works of literature. But she also collected a few hundred photographs, primarily of the people who were her subjects. These photos likely jogged her memory as she continued to rework her diary up throughout Reconstruction and until her death in 1886. Since then, the photographs and her written words were split up. Molly [pictured] went from being Mary Boykin Chesnut's maid to becoming her business partner in a dairy after the Civil War. Her diary, first published in 1905, would become famous. Her photographs, however, disappeared — at least from the scholars and family members most involved in keeping Chesnut's legacy alive. Today, her words and pictures soon will be back together at the University of South Carolina. A new two-volume set published this month, which includes 'Mary Chesnut's Diary from Dixie,' and 'Mary Chesnut's Civil War Photograph Album,' gives the broader understanding of Chesnut's work and of what's been missing all these years. The story of their reunification is an epic one in itself, with drama, angst and ultimately a happy ending. Chesnut had no children, but her sister's descendants, now scattered across the country, have continued to find out all they can about her life and work. Along with Chesnut scholars, such as C. Vann Woodward, who won the Pulitzer Prize for his 1981 expanded edition of her diary, the family tried to find out what happened to the photo albums. All they knew was the albums vanished from an ancestor's home in Baltimore in 1931. Since then, the family and Woodward would get occasional tips about their whereabouts, but the trail always went cold. Until November 2007. That's when their owner, John O'Brien of West Virginia, put them up for auction in Nashville. Historians in Charleston spotted the auction and contacted The Post and Courier, which did a short story about their concerns that this important historical record would end up in private hands or, even worse, bought by someone who would sell the photos off individually. The story was seen by Margot Rose of Charleston, a cousin of the Daniels family in Camden, which lived in Mulberry Plantation, one of Chesnut's homes, said Marty Daniels. 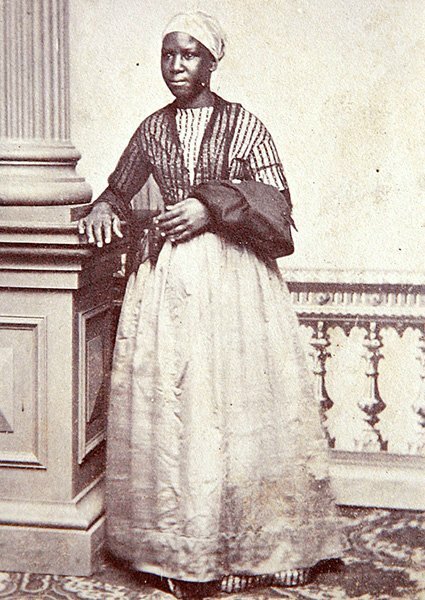 Daniels' mother, Martha Williams Daniels, had spent much of her life doing historical research on her famous ancestor. The family, about 50 members of which had gathered for Thanksgiving at Mulberry, had about three days to figure out how to find the money, knowing the winning bid could surpass $200,000. The extended family prepared for the auction by sending emails to clarify how much each family member could pledge toward their purchase. Martha Daniels, 84 at the time, took the lead. Some elementary school-age children in the family pledged $100 from their savings accounts. The family also called other South Carolina libraries and historical groups whose interest might be keen to ask them not to compete and bid up the price beyond the family's means. They also contacted Austin Sheheen, a family friend, a collector of early South Carolina currency and uncle of recent gubernatorial candidate Vincent Sheheen, to phone in to the auction and represent the family. 'We figured we had to take a chance and try,' Marty Daniels said. Photography was emerging in the 1860s, and people of means often posed at studios for cartes de visite, French for visiting cards. Many were taken by the nation's most famous wartime photographers, including Matthew Brady and Charleston's Quinby and Co. They're among the earliest photographs even taken in the state, since studio portraits were just becoming popular as the new technology emerged. During the past four years, Daniels and archivist Barbara E. McCarthy researched the photos and were able to identify all but six. 'Our take on it is she was consciously creating the two to go together,' Daniels said of the diary and photos. While the auction house said there were 211 pictures, it turned out about 25 were missing. The seller, John O'Brien bought them just in time to keep the albums from being dismantled by a collector. O'Brien later helped the family track down more than a dozen missing photos apparently removed by the previous owner. With their book project done, the family is poised to hand them over to the South Caroliniana Library, which also holds Chesnut's diaries. There, others can continue to research them. Henry Fulmer, the library's curator of manuscripts, said the two belong together. As the Civil War drew to a close in 1865, thousands of prisoners streamed home from prisons North and South, victims of often haphazard systems that fostered both intentional cruelty and unintentional suffering. More than four hundred thousand soldiers endured captivity during the war, and nearly one-tenth of the soldiers who died during the war years breathed their last within the confines of a prison. Though most of the returning soldiers would mend physically, the question of what happened to them and their comrades, and how their experiences fit within the emerging interpretation of the colossal struggle, would weigh on their minds and those of generations after them. Benjamin G. Cloyd's recent Haunted by Atrocity is a welcome and timely voice in the ongoing struggle to understand the memory of the Civil War. In a discussion that is dominated by models of either combat veteran memories transitioning into the postwar commemoration or ladies' societies navigating complex political waters through monuments to the fallen, Cloyd's book weaves a complex story that not only incorporates the difficulties of competing postwar narratives, but also adds the depth of a group of veterans that are frequently overlooked but whose often vitriolic responses had a lasting effect when other interpretations faded. Focusing largely on Andersonville, Haunted by Atrocity examines the influence that the prison and its inmates' memories had on six distinct time periods. The overarching story of the prisoner experience, ranging from the earliest weeks of the Civil War to the impending sesquicentennial, is one that remains controversial even as reconciliation movements dull the edge of postwar rhetoric. In addition to discussing an important yet often overlooked facet of the struggle to privilege certain memories, Cloyd's book also provides tangible evidence that some of the emotions generated by the Civil War remained extremely potent despite the passage of time. Beginning with the genesis of the prisoner-exchange cartels, the author charts the prisoners' experiences in the first chapter. Cloyd shows that the burgeoning systems regarding prisoners of war quickly broke down under unanticipated pressures caused by the vast numbers of captured soldiers following the war's early battles. He also draws the reader's attention to the early charges of barbarism and atrocity, their uses in propaganda on both sides, and their effects on the psyches of the incarcerated soldiers. Following this chapter on the war itself, Cloyd delves deeply into the growth of the memoir industry and its impact on the evolving interpretations of the conflict. 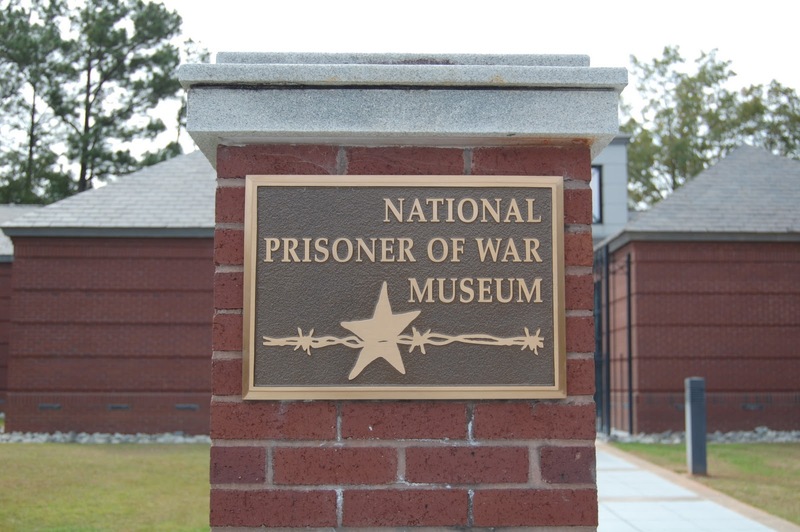 During much of Reconstruction, virulent attacks on the South dominated the memory of the prisons, in particular with regard to Andersonville. The narrative was not completely one-sided, however, and Cloyd contrasts the overt vehemence of the Union veterans with their more quiet Confederate counterparts. The latter's recollections ultimately set the stage for the drastic changes to the war's interpretation in the form of the Lost Cause narrative. Haunted by Atrocity's next two chapters on the period between 1877 and 1914 differ significantly from the way many other treatises on Civil War memory interpret the rise of the Lost Cause. Whereas most works on this period emphasize a relative relaxation of the animosity that drove postwar politics, Cloyd shows that prisoner memoirs clung even more fervently to descriptions of barbaric captors and systems designed to torture or kill inmates. It was during this period, as well, that former Confederates began publishing prisoner-of-war memoirs. Equally as vehement as the accounts from Union veterans, the stories told by Southerners were also part of an effort to reclaim a status as equals within society and to lay claim to the memory of the war. As major commemorations occurred on former battlefields throughout the South that often featured former enemies coming together and posing for photographs, former captives from both sides joined in the telling of the Civil War by employing highly charged language and divisive rhetoric. These chapters do conform, however, to the standard interpretation of the evolution of the war's memory in terms of the Emancipation narrative. Former prisoners often reacted violently to African American celebrations at sites like Andersonville. As Cloyd points out, these riots and physical altercations that broke out at numerous Memorial Day celebrations in the South as African Americans gathered to remember the sacrifices of Union soldiers who had languished and died in prisons eventually all but silenced the Emancipation narrative. A final point discussed by Cloyd in these two chapters examines the question of commemoration at the prison sites. Veterans' groups placed thousands of monuments on fields stretching from the wilds of Texas to Gettysburg, yet few were met with such hostility as those of contested figures at former prison sites. Cloyd uses major points of controversy, such as the proposed monument to Henry Wirz, and the monument to the Confederate dead at Camp Chase, as bellwethers throughout the second chapter. He employs those monuments to show that the viewpoints of former prisoners had become increasingly disparate as the limits of reconciliation were stretched in that era, and living veterans of the war became even more firmly entrenched in maintaining the memories of their departed comrades. Since the general feeling of reconciliation and "shared recognition of what it meant to be a soldier" did not encompass the experiences of the prisoner of war, "the same factors that encouraged national reconciliation continued to promote discord in the specific instance of Civil War Prisons" (p. 109). The last three chapters of Haunted by Atrocity explore the legacy of the prisons as their roles shifted in the twentieth century. One of the greatest changes that Cloyd explores is the decline of subjective, first-person accounts of the prisons in favor of more objective, historical analyses of the prison experience, as well as the rise of Civil War prisons in fiction. Historians came to use the prison experience, from both the small, firsthand accounts to commandants' and politicians' reflections, to exonerate numerous individuals and to portray many captors as average human beings, rather than as barbarians. 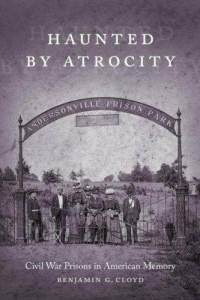 Fiction could blur that line to an extent, as Cloyd illustrates through post-World War II stories that drew light parallels between such Civil War prisons as Andersonville and concentration camps. Largely, however, the discussion of captivity during the war, as well as the political machinations that influenced policies, entered a new phase in the twentieth century, which opened the door to new interpretations that precluded simplistic notions of cruelty for cruelty's sake as had been a hallmark of the discussion for decades. As early as the late nineteenth century, prisons evolved into tourist sites as opposed to purely commemorative sites . . . .
For Cloyd, the creation of the National POW Museum at Andersonville is the natural and logical "consequence of our accepting the objective memory of Civil War prisons," and has transformed a site with a divisive past into a place and memory that is malleable enough to be used for true reconciliation and healing (p. 177) . . . . The only problem that arises from Cloyd's treatment of prisons in the Civil War and their memory worth mentioning is his seeming bias regarding some of the more modern descriptions of the various sites. While the author very clearly points out the traumas and political agendas motivating the writings of veterans, he has less patience for treatments of the subject that have come in the past approximately fifty years, particularly those that seek to exonerate or glorify the South . . . . Despite focusing largely on Andersonville, a fact acknowledged by the author in the introduction, Haunted by Atrocity succeeds in weaving context and complexity into a topic that needs more voices. 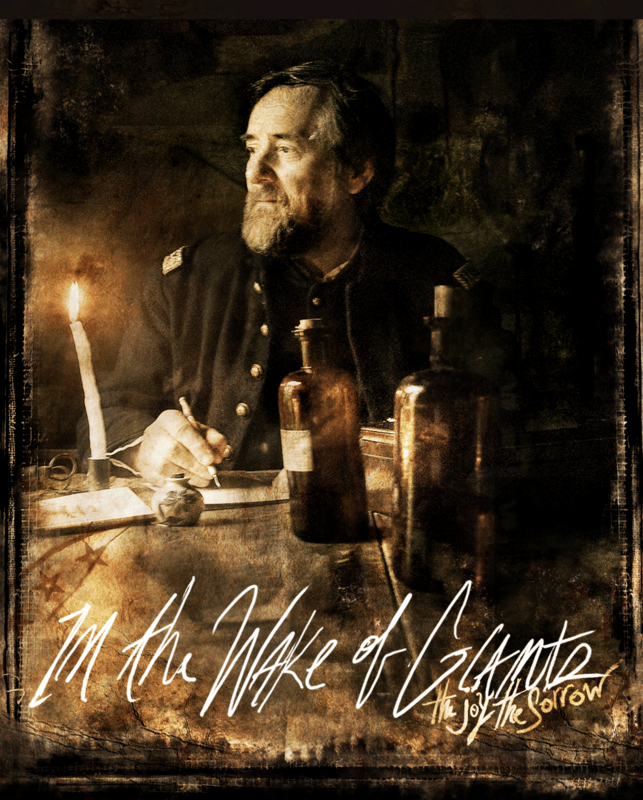 Cloyd's use of Andersonville as a case study provides an intriguing backdrop for the study of Civil War prisoners and their relationship to the contested memories of that conflict. This setting, both in terms of physical location and current monographs, makes this work an excellent tool for effectively comparing and contrasting the evolution of memories as they pertained to various aspects of the war. Haunted by Atrocity offers much food for thought regarding the way historians interpret the war's effect on prisoners, soldiers, civilians, and society, and will surely cast a long shadow on the field of Civil War and memory. The Artillery Service in the War of the Rebellion, 1861-65, John C. Tidball, Lawrence M. Kaplan, editor, Westholme Publishing, 400 pages, 30 b/w illustrations, maps, notes, index, bibliography, $30.00. Release Date:October 28, 2011. 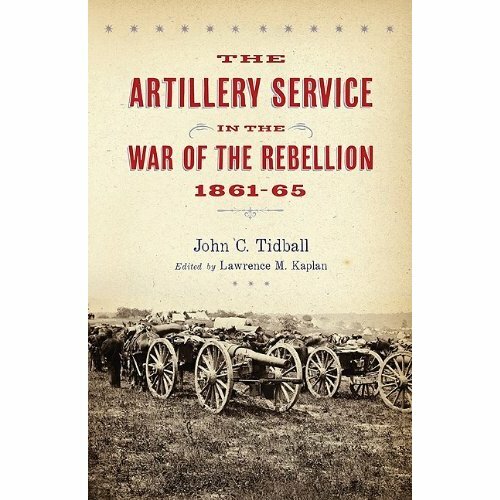 The Artillery Service in the War of the Rebellion, 1861–65, is a comprehensive overview and analysis of the U.S. Army’s field artillery service in the Civil War’s principal battles, written by John C. Tidball, a distinguished artilleryman of the era. The overview, which appeared in the Journal of the Military Service Institution from 1891 to 1893, and nearly impossible to find today, examines the Army of the Potomac, including the battles of Fair Oaks, Gaines’s Mill, Mechanicsville, Malvern Hill, Antietam, Fredericksburg, Chancellorsville, and Gettysburg; the Army of the Tennessee, including the battles of Stones River and Chickamauga, and the Army of the Ohio’s battle of Shiloh. Tidball, a decorated Civil War veteran and superintendent of artillery instruction for the army, expertly presents the war through an artilleryman’s eyes in explaining the organization, equipping, and manning of the artillery service. His analysis highlights how the improper use of artillery, tying batteries down to relatively small infantry commands that diluted their firepower, seriously undermined the army’s effectiveness until reforms produced independent artillery commands that could properly mass artillery fire in battle. John C. Tidball, 1825–1906, was a career army officer and Superintendent of Artillery Instruction at the Artillery School from 1874 to 1881. He served through the Civil War in most of the major campaigns in the Eastern Theater, from the first battle of Bull Run through the siege of Petersburg. He was brevetted five times for gallant and meritorious conduct on the field and ended the war as a brevet major general. Lawrence M. Kaplan is chief historian of the U.S. Missile Defense Agency. He has served as a staff historian at the U.S. Army Center of Military History, Washington, D.C., and as a staff historian at the U.S. Army Field Artillery Center, Fort Sill, Oklahoma. He is the author of Homer Lea: An American Soldier of Fortune. 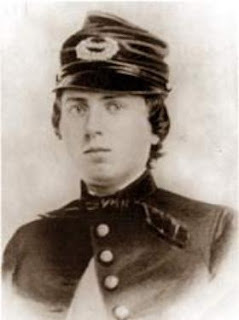 News---Lt. Alonzo Cushing's Medal of Honor: Ain't Got No Home, Yet. Delafield Battling For Cushing Medal, Kelly Smith, Lake Country Reporter, Feb. 23, 2011. The Common Council will send a letter to the White House as part of the city's effort to accelerate its campaign to become the home of the Medal of Honor that will likely be awarded to Civil War hero Lt. Alonzo Cushing. Cushing is a Delafield native who was one of four brothers for whom Cushing Elementary School and Cushing Park were named. Cushing, a West Point graduate with a brilliant career as a 21-year-old Union officer, is slated to receive the country's highest military award posthumously for his gallant, but fatal, stand against Maj. Gen. George Pickett's charge on Union forces at Cemetery Hill during the third day of the Battle of Gettysburg on July 3, 1863. The letter urges President Barack Obama to approve the secretary of the Army's recommendation that Cushing receive the medal. "Even though he was horribly wounded several times during the largest bombardment in the history of this continent, he refused to leave his command. When his commanding officer told him to move to the rear and get medical attention, he requested permission to move his cannons forward, instead," according to the letter. Cushing was fatally wounded as he fired his remaining canister charges at the attacking rebel forces, the letter added. "We speak for our community in letting you know how much it would mean to the Cushing descendants, our residents and to Americans who still remember the gallantry of those who fought and died in the name of freedom, for you to sign the approval for the Medal of Honor for Lt. Cushing," the letter states. The letter was drafted by David Krueger, who was appointed by Mayor Ed McAleer last year to serve as the city's representative in efforts to have the medal donated to the city. Krueger said there are conflicting reports over whether the president's approval is the final step in the process of awarding the medal to Cushing or whether final action is also required by the U.S. Senate. Cushing apparently has no surviving direct descendents, according to Krueger and city historian Margaret Zerwekh. The 91-year-old Zerwekh launched the campaign 30 years ago to have the Medal of Honor awarded to Cushing for his gallantry in the battle that was a turning point in the Civil War. "She started it by writing Sen. William Proxmire,(who served in the Senate from 1857 to 1989) and then she wrote Sen. Russ Feingold and Presidents George H.W. Bush, Bill Clinton and President George W. Bush," Krueger explained in a recent interview. Feingold announced on March 9, 2010, that the secretary of the Army had approved the medal for Cushing. Since then, Zerwekh and city officials have been urging military and congressional officials to hold the awards ceremony and display the medal in the City of Delafield, where Cushing was born. However, in a recent interview Krueger said that representatives of three other locations might also be vying to host the ceremonies and display the medal. He said there may be distant relatives of Cushing who are campaigning online to have the medal awarded in Fredonia, N.Y., where he spent much of his life. Another potential site is the Military Academy at West Point, where other posthumously awarded Medals of Honor are displayed. Krueger added there is also an online campaign by some Civil War buffs to have the medal awarded to the Gettysburg National Military Park where a $100 million visitors center was built four years ago. 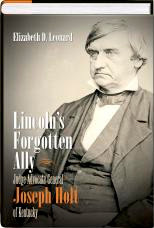 Lincoln's Forgotten Ally: Judge Advocate General Jospeh Holt of Kentucky, Elizabeth Leonard, Univ. 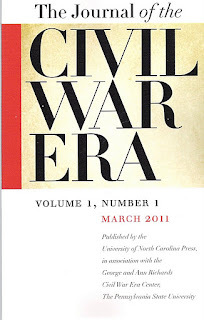 Of North Carolina Press, 448 pages, notes, bibliography, index, $40.00, Release Date: October 10, 2011. Lincoln's Forgotten Ally, Review by William C. Davis, History Book Club. First impressions are important, and for most people who first see his hard stare and cold features, impressions of Joseph Holt seldom improve upon familiarity. When he is recalled at all, it is as the implacable and merciless prosecutor of the conspirators involved in the kidnapping and assassination plots against Abraham Lincoln. Almost a century and a half after the trial of the criminals, Holt is still largely remembered for allegedly suborning perjury and paying for damning testimony to take the trial beyond just those immediately involved, seeking to implicate Confederate President Jefferson Davis and others in high position in the Lost Cause. Elizabeth D. Leonard's new Lincoln's Forgotten Ally: Judge Advocate General Joseph Holt of Kentucky is a welcome tonic to long-held prejudices. If Holt was indeed relentless in his pursuit of Lincoln's killers, still he was also firmly opposed to slavery and a staunch supporter of the Union from the outset despite being a Democrat from slave-holding Kentucky. He served in the lackluster cabinet of the equally lackluster President James Buchanan, first as postmaster general, and then as secretary of war after scandal rocked the administration. When war broke out Holt at first took a commission as colonel of a Union infantry regiment, but in 1862 Lincoln appointed him judge advocate general of the Union army. No one likes a prosecutor as a rule, and as judge advocate, prosecution was Holt's mandate. He pursued the case against General Fitz-John Porter, a popular and capable officer who ran afoul of internal army politics, and then became the guiding force behind the trials of the Lincoln conspirators. The convictions were perhaps his greatest success, though the manner in which they were obtained tarnished his image ever after, and effectively ended any hopes he may have had for a postwar political career. Lincoln's Forgotten Ally is the first full biography we have had of Holt, and the author is more than equal to the task of taking a two-dimensional figure and putting flesh on his bones. Throughout Holt's life his devotion to the Union comes through, from his efforts to keep Kentucky from seceding, to his work in making the Emancipation Proclamation effective, and his postwar efforts to use his office to make sure that military forces occupying the South during Reconstruction effectively implemented the reforms implicit in the 13th, 14th and 15th amendments to the Constitution, while combating the rise of the Ku Klux Klan and other extremists. When he died in 1894, his body was wrapped in a battle flag that he had kept for that purpose for almost 30 years. Combining in-depth research and able narrative with measured judgment, Elizabeth D. Leonard has given Holt that necessary third dimension at last, and in the process filled an important void in our understanding of the men and measures that turned Lincoln's vision into a reality. The Civil War at 150: The Past In The Present?, David W. Blight, Kansas City Star, October 3, 2011. Why can’t we just get over the Civil War in America? Why does it still have such a hold on our imagination, on our political habits and rhetoric, on the stories through which we define ourselves as a people and a nation? Why is the Confederacy, a mere four-year experiment in revolution to preserve a slave holding society, still so interesting to so many people? Haven’t we had at least two “Reconstructions” — the first of the 1860s and ’70s, the second the civil rights movement a century later — to solve those issues at the war’s roots? As we commemorate this most pivotal and transforming event — at the same time the country descends into some of the worst political polarization in modern times — it is important to visit these questions. The stakes are very high. And, ideologically, many of the issues of 2011 are much the same as in 1861. Given the hold the tea party seems to have on the base of the Republican Party, we should take notice when some in the group invoke the Confederate constitution as a model for anti-tax, anti-centralization libertarianism. First, it was modeled closely after the U.S. Constitution. Second, its advocates may need a reminder of just how desperately the Jefferson Davis administration struggled to forge a centralized government out of the chaos of war, jealous localism, states’ rights and homegrown greed and individualism. Indeed, yesterday’s secessionists and today’s nullifiers have much in common. Both are distinct minorities who have suddenly seized an inordinate degree of power. One acted in revolution to save a slaveholders’ republic; the other seems determined to render modern federal government all but obsolete for any purpose but national defense. Both claim their mantle of righteousness in the name of “liberty,” privatization and racial exclusion (one openly, the other using code that keeps it largely a white people’s party). Both vehemently claim the authority of the “Founders.” Compromise? Both professed disinterest, indeed seemed to welcome rupture. All this we might have thought all but buried in the mass slaughter of the Civil War. But, alas, history keeps happening. This month, Texas Gov. Rick Perry chose to announce his presidential candidacy in Charleston, S.C., where secession and the Civil War began. Merely coincidental? This is the man who in 2009 suggested his state might consider “secession” as resistance to federal authority. Perry crafted this line for his now larger national audience: “I’ll work every day to try to make Washington, D.C., as inconsequential in your life as I can.” What would the United States be if Abraham Lincoln’s administration and the federal government had decided to be “inconsequential” in 1861? Texas secessionists would have realized their dream back then. But how would have West Texas farmers in Depression-era Haskell County — where Perry grew up — have gotten electrification but from a consequential federal government? Just how would racial segregation have been dismantled there or the rest of the country? And would we prefer to have federal standards less consequential for food and drugs? Or how many national parks would there be if the feds had simply never bothered to be consequential in land use and natural resources. What kind of air might we be breathing if there were no Clean Air Act? Interstate highways? Social Security? Workplace safety? College loans and the GI Bill, which helped forge an American middle class? An endless list. We all make the past useful to our personal present, some more than others who might negate a social contract with their fellow humans in the service of private “freedom.” Is it possible that at the heart of this dispute is that the federal government — however cumbersome amid the arcs of history bending forward and backward — has actually been a vehicle for the increase of democracy and equality, and that some Americans resent this? We live in a society in 2011 not only divided over race and the advent of a black president, over the rights of immigrants, over religious tolerance, over a seemingly permanent state of war, over who and what are legitimate Americans and whether they shall be accorded birthright citizenship. And we have ceaseless debate about the proper relation of federal to state power. That “Union” preserved by the Civil War generation, turning 150 years old, is not a healthy organism. Yes, the Civil War is rooted in states’ rights. But the significance of any exercise of states’ rights, like any other constitutional doctrine, is always in the issue to which it is employed. Today, states’ rights claims are advanced by many governors and Republican-majority legislatures in the very language of “secession” and “nullification” made so infamous in antebellum America. They are aided and abetted by a conservative majority on the Supreme Court, although the justices have not justified “nullification” by name. What indeed has brought those words back into our political parlance? A short list of examples among many tells us just how alive some Civil War legacies are in our time. Kentucky has a bill pending to make that state a “sanctuary” from the Environmental Protection Agency. Arizona Republicans want to exempt products made in their state from federal interstate commerce laws. Montana has one bill that would “nullify” the federal Endangered Species Act and another to require the FBI to get a local sheriff’s permission to make any arrests. Contexts change, of course, but we have a history with these ideas, and it had a terrible result in 1861. Put most directly, either the United States reborn in slave emancipation is based on a social contract, forged and reforged by the new historical imperatives of industrialization and urbanization in the Progressive era and by a horrible economic Depression in the 1930s and a civil rights revolution of the 1960s, all of which for real reasons necessitated the increased exercise of federal power to protect human liberty, welfare and survival, or it is not. The conservative movement in America, or at least its most radical wing, seems determined to repeal much of the 20th century and even its constitutional and social roots from the transformative 1860s. The Civil War is not only not over, it can still be lost. As the sesquicentennial ensues in publishing and conferences and on television and countless websites, one can hope that we will pursue matters of legacy and memory with one eye on the past and the other acutely on the present. David W. Blight teaches American history at Yale University and is the author of the just released “American Oracle: The Civil War in the Civil Rights Era,” as well as the multiple-award-winning Race and Reunion: The Civil War in American Memory. CWL: CWL respects and has thoroughly enjoyed Blight's work. Having read his very new American Oracle, CWL's respect has grown even more. 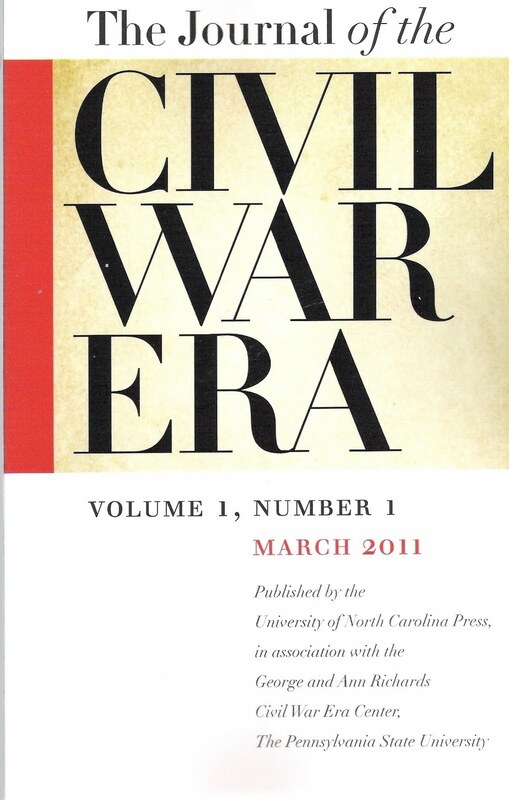 American Oracle reviews the Civil War Centennial as perceived by William Penn Warren, Bruce Catton, James Baldwin and others. It is part American literary history, part historiography and part biography. Read in the course of a week, it became a 'couldn't put it down' book. But the U.S. government of 1861, 1931 and 1981 is not the government of 2011. Those governments were all much smaller than the government today which seems not to be able to do levee maintenance well, clean up oil spills well, monitor investment firms well, management a budget well, nor guide the American economy well. Instead of being too big to fail, the national government may be too big to succeed. E.F. Schumacher wrote a book during the 1970s entitled Small Is Beautiful: Economics As If People Mattered. That small truth may be applicable today. By the way, CWL is a 'Wide Awake for Lincoln' man and scoffs at the Lost Cause but has come to understand that the current national government may itself need a 'Reconstruction'.